I love this phase of construction. You can really start to 'see' the kitchen come to life. Next week the counters and back splash will go in and then from there on everything will go really fast - paint, then all the plumbing and electrical fixtures, the cabinet hardware and glass fronts. Today is day 'nine' of the remodel. We started demo on June 4th. My client has a bet with her brother that the kitchen will be done from start to finish in 8 weeks. It is looking really good that she is going to win! I'm wondering if I get a 'bonus' if I can cut that time in half! 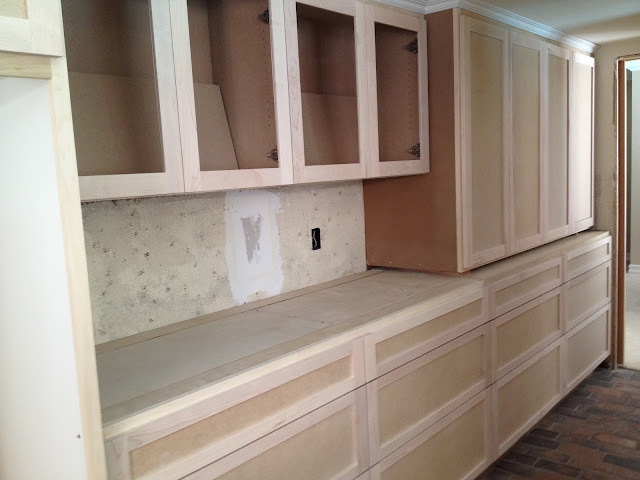 This is what the cabinet looked like before demo. Can you see how we changed the long pantry doors to a split cabinet with all drawers on the bottom? Drawers increase functionality by 100% in my book! And speaking of functionality ... I am working on a small upholstery job - recovering some barstools for a long distance client - and had more fun perusing through all the vinyl books. Have you ever considered 'pleather' or vinyl? It is a must for this eat-in bar where little kiddos will be spilling ... but I have to say, there will be no sacrificing for style! Good to see you are always up to your "master designer self~"
love my bottom drawers....in my kitchen. makes it so easy to find things. Loving the kitchen transformation! I was just at my design center today looking at that exact Duralee vinyl for a client project. Great minds think alike! That is too funny Marianne! Kitchen renovations really excite me, but really what doesn'ts? Probably because our kitchen was our largest renovation and I know how good it feels when it's complete and the homeowner can enjoy it 100%. Drawers are wonderful - so glad we added more of them into our plan. And I haven't done any projects with vinyl yet but glad that you've found some good selections w/ Duralee.